COX-1 antibody LS-C14610 is an unconjugated rabbit polyclonal antibody to COX-1 (PTGS1) from human, bovine, horse and other species. Validated for ICC, IHC and WB. PTGS1 / COX-1 antibody was raised against synthetic peptide corresponding to aa 272-282 (L272MHYPRGIPPQ282) of sheep seminal vesicle COX-1. Percent identity by BLAST analysis: Human, Gorilla, Gibbon, Sheep, Bovine, Horse (100%); Monkey, Dog (91%); Bat, Rabbit, Pig (82%). Recognizes human, sheep and bovine endothelial COX-1. Also recognizes pig COX-1. Does not cross-react with mouse or rat COX-1 and human, mouse or sheep COX-2. 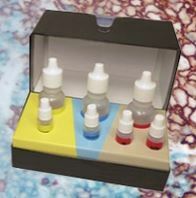 Suitable for use in Immunohistochemistry, Immunocytochemistry, Western Blot.